Regular aeration is integral to maintaining a healthy lush lawn. There are two main types of aeration that we carry out for our clients throughout the year; hollow tine aeration and slit tine aeration – both highly beneficial at different times of the year. 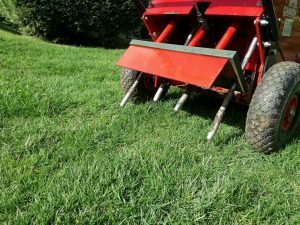 What are the benefits of aerating a lawn? A vital air exchange happens when removing thousands of small cores from the lawn or creating thousands of slits. Oxygen, vital for root growth, gets into the compacted layer and carbon dioxide, so harmful as it inhibits the passage of water to the roots, escapes. Best performed in the spring and autumn, hollow tine aeration is the process of removing thousands of cores from the lawn. It is the most effective way to release compaction (usually occurring 2-3 inches below the surface) and an integral treatment for a lawn. Why is compaction is a problem? Imagine laying a 3 inch thick turf on your patio or driveway, how far down will the grass roots be able to spread? Lawn compaction posses the same issues for grass roots. Over time your lawn will become compacted through traffic and mowing, causing the particles of the soil to squeeze together. Compaction drives air out and as a consequence root development becomes stifled, poor root development below the surface results in poor grass plant development above the surface. Hollow tine aeration also creates an environment to prepare the lawn for over-seeding and where possible the lawn can be top dressed with a PAS 100 compost. The top dressing will help to cover the grass seed, if applied, but more importantly, will filtrate into the holes made by hollow tining – keeping the area below the turf open and allowing the lawns roots to develop. What is slit tine aeration? Best performed over the winter, using custom made chisel tines, we create thousands of 6mm x 25mm inch slices in the lawn, this slitting action breaks down thatch, prunes the roots and aerates the soil. Winter is a opportunity for moss and disease to take a foothold, by slit tine aerating over the winter we find that lawns greatly improve their disease and moss resistance whilst improving their root development, the benefits can be seen year round but especially as a lawn comes into spring.